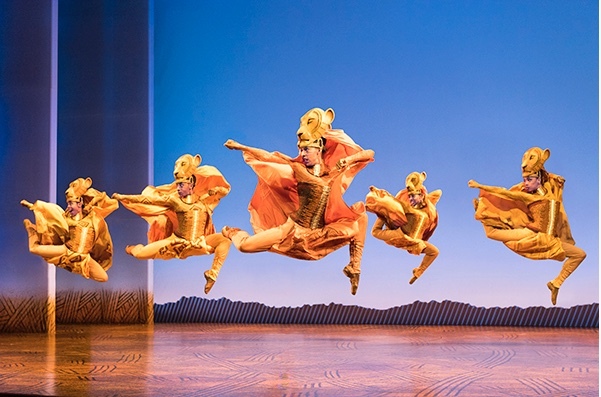 The “Circle of Life” has brought The Lion King back to The Bushnell and the magic of this show is that every viewing can seem like the first. So visually stunning and breathtaking in execution, it would be impossible to catch every bit of storytelling magic in just one sitting. The story is simple, but it is the execution that dazzles. Based on the animated Disney film, it is the Africa-set tale of young lion cub, Simba, finding his place in the world after losing his father, Mufasa, to duplicitous Uncle Scar. Along the way we meet some drooling hyenas, courageous lionesses and a carefree meerkat and warthog team, Timon and Pumba. Easy enough for even the youngest fans to follow, leaving plenty of time for the visual effects to keep all ages enthralled. Colorful backdrops (feel the heat! ), gorgeous lighting (starry night! ), shadow play (look at the mouse! ), puppetry (Mufasa appears from the sky!) and “costumes” that require 3 people to wear them (Elephant! ); sometimes it is hard to decide if something should be considered a character or a piece of scenery. The show is such a visual feast, that, at times, one can be so distracted by all the sites that one can quickly forget that there is also singing going on! Of course, it helps that many of the songs by Elton John and Tim Rice have become “standards”; “The Circle of Life”, “Can You Feel the Love Tonight” and “Hakuna Matata”, which prompted spontaneous hand-clapping within only a few opening notes. Even though its source material derives from Disney, there is real authenticity here, with additional music by South African composer Lebo M. who weaves 6 native languages: Swahili, Zulu, Sotho, Tswana, Congolese and Xhosa (the “click” language) throughout. Xhosa is on great display by Mukelisiwe Goba, also from South Africa, as Rafiki, the wise baboon, who endears herself to the audience the moment she enters the stage with her smile and mischievous nature. As befits a show that encompasses the wide African plains, the cast is immense, with well over 35 players, including those with such specialties as “Buzzard Pole” and “Gazelle Wheel”. But Salahedin Safi as “Young Simba” and Danielle W. Jalade as “Young Nala” leave the biggest impression, probably because they are the same age and energy level as their contemporaries in the audience. But every lead is note perfect and their passion for the material is evident. The energy never flags for a moment. 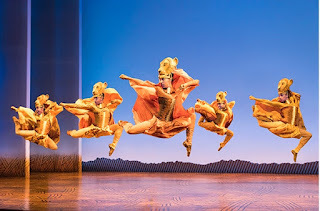 Unlike some touring companies, full credit for direction and choreography is still attributed to the original Broadway creative team of Julie Taymor (Director/Costume Design) and Garth Fagan (Choreography). Simply put, this means that one can’t really get any closer to the original production without traveling to NYC. Since that production won six Tony Awards, including best musical, this production is a “must see!"